If ziplining is on your bucket list, it’s time to check off that box. Imagine speeding through the treetops with the wind in your face and feeling a rush of adrenaline. Ziplining is a great activity to try this spring and summer when the weather starts to warm up. There are quite a few places to zipline Asheville NC but this one happens to be one of our favorites. The best place to go zipline Asheville NC is Navitat in the Blue Ridge Mountains. While you’re planning your trip to North Carolina, don’t forget to download our Chimney Rock, NC Vacation Guide. Spring is a beautiful time of year to visit the area. This free guide is packed with great tips like zipline Asheville NC, upcoming festivals and events, the best places to eat, and more! And even if you call Chimney Rock home, our free vacation guide has some great recommendations on fun things to do! Navitat Asheville NC has been serving thrillseekers since 2010. Their main goal is to thrill, educate, and inspire each guest with their 2 zipline tours. The Moody Cove Adventure features a 1,250-foot zip across Moody Cove. This tour has been recognized by USA Today as “one of the best in the nation”. While you are 200 feet high in the air, you will also experience their spiral staircase and rappel at the end down to the forest floor. The Blue Ridge Experience allows guests to zipline side by side. This 2.5-hour excursion will take you on 3 ziplines flying at speeds of 65mph. Their experienced guide will also have you walking on 4 trails through the forest. If you can’t pick just one, experience both tours on their Ultimate Adventure Package. Ziplining might sound a bit a risky, but you have nothing to fear at Navitat. Their staff consists of people who are both trained and dedicated to ensuring that your ziplining trip is not only the best but the safest. Navitat is located at 242 Poverty Branch Road. 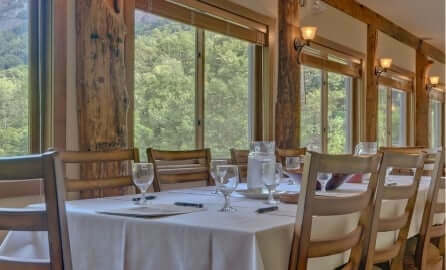 Reservations, which must be made in advance, can be made online or by calling 828-626-3700. 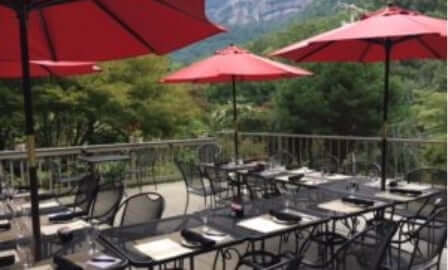 Less than an hour from Asheville in beautiful Chimney Rock is The Esmeralda Inn & Restaurant. 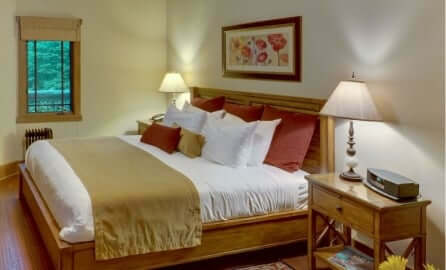 Our location is the perfect place to stay while exploring the Asheville area. Our Inn is home to 14 guest rooms, a large common area, and a game room. We treat each guest to a full breakfast each morning. It’s just what you’ll need before you set out on your zipline Asheville NC adventure. When booking your reservation, be sure to ask us about our Mountain Adventure Package. This makes a great add-on to any stay. You’ll receive a picnic for 2, a 2 hour horseback riding tour, and dinner for 2. 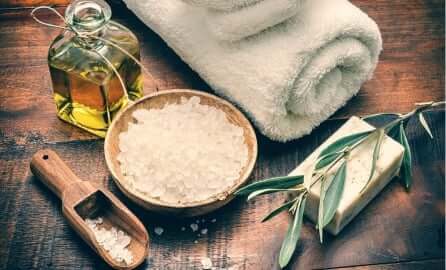 Whether you’re celebrating a special occasion or just need some time away, we do hope that you will come and stay with us soon.